We have lot of attractions nearby like Sky tower, Ponson.. I stayed in more than 30 hostels in New Zealand and Freeman's lodge was one of the best. Hospitable and friendly - top location. 24 hours shuttle service available. We have a reputation with travellers and tourists alike for being a friendly, cosy, clean and comfortable establishment, with a homely atmosphere. FREE WI-FI INTERNET is available 24 HOURS for our guests. We have 2 comfortable lounges & 2 kitchens. Walking distance to the city centre, super market, post office and bus stops. 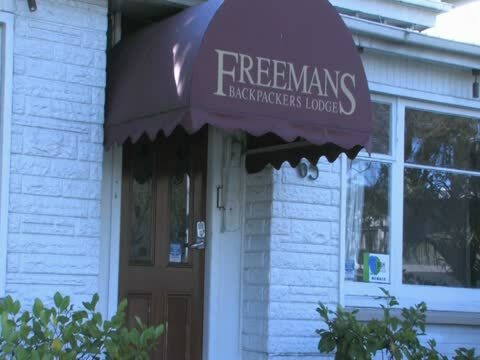 Freeman's Backpackers Lodge is a well-known backpackers lodge located just 10 minutes walk to Auckland's CBD. Minutes walk to the city centre, Sky Tower & attractions of Auckland. IRD forms are available here for the Working Holiday VISA guests & we give reference letters to the guest to open bank account as well. If you are here to buy a car or a campervan, we give you all the tips & information you require. We also help our guests with very competitive car rentals rates. We have an 2 excellent lounge & 2 common kitchens for your comfort along with FREE INTERNET & FREE WIFI so you are always in touch with your family & friends. A garden is there at the back where guests can relax and enjoy the Auckland weather. We are located at 65 Wellington street in Freemans Bay which is just 10 minutes walk to downtown Auckland, super market and Ponsonby Road where you will find lots of cafes & restaurants. Our helpful office staff are happy to assist guests with bookings to the Bay of Islands and Rotorua and with their car rental arrangements. Copyright © Freemans Backpackers Lodge 2012. All Rights Reserved.